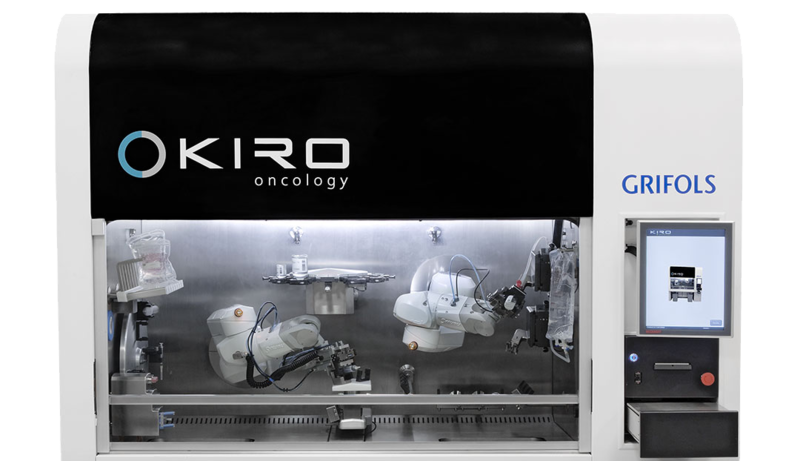 KIRO® Oncology is the next-generation system for automated compounding of intravenous treatments, including cytotoxics and biologicals. KIRO® Oncology has a small footprint and can be integrated into existing clean room facilities with minimum installation requirements. KIRO® Oncology can be integrated as a biosafety cabinet in USP797 and GMP compliant facilities to support their monitoring and qualification procedures. KIRO® Oncology performs gravimetric controls at each step of the compounding process, and releases final products based on their accuracy to the prescribed dose. Barcode readers and cameras located inside the cabinet and in the user area precisely identify vials, IV bags, and supplies by comparing images and barcodes with those stored in the system database. KIRO® Oncology provides a continuous ISO 5 class environment during materials loading and automatic compounding of sterile preparations, protecting the user and also the environment. It can be integrated as a biosafety cabinet in USP797 and GMP compliant facilities to support their monitoring and qualification procedures. KIRO® Oncology protects the operator from repetitive stress injuries and from exposure to hazardous drugs. The cabinet is only opened for loading and unloading; but it is closed during the entire compounding and cleaning processes. The KIRO® Oncology system is compatible with many types of final containers (bags, syringes, cassettes and elastomeric pumps) and, as a result, can be used with a wide range of products. It can prepare both patient specific and small batches using liquid or lyophilized drugs. Two robotic arms run in parallel to perform different tasks at the same time. Partially used vials are held in the cabinet for subsequent doses, thereby making optimum use of expensive drugs. The built-in software ensures that partially used vials can be fully tracked. Additionally, during automatic preparation, the operator is free to perform other tasks. KIRO® Oncology is the only system with a self-cleaning process for the decontamination of hazardous chemicals. KIRO® Oncology has a built-in dual-port waste transfer system that safely eliminates contaminated waste into self- contained bags. Waste disposal is compatible with the use of standard hazardous waste containers. The KIRO® Oncology database can be connected to EMR/EHR systems through various interface protocols and messaging standards, including HL7.